When was the last time you got a babysitter, made plans and went out to do something decidedly adult? It had been awhile for us, so when I got the opportunity to go experience a show at the Improv for FREE, I was all over it! Even though I've lived in Dallas my entire life and experienced many of the Dallas "experiences" - most more than once - I managed to make it to 33 years of life without ever going to a comedy show at the Improv. George was not disappointing, but even the opening acts before him were truly funny. All of the comedians did a great job of involving the audience. It truly makes the show unique as each crowd is different than the one before and the one after. I have to tell you we were blessed with great seats, right next to the stage, even though we arrived just a few minutes before the show began. Had our seats not been reserved, we would have had a difficult time finding three seats together and would likely have been way in the back. If you are planning to go on a Friday or Saturday night, you should probably plan to arrive early in order to get the best seat possible. 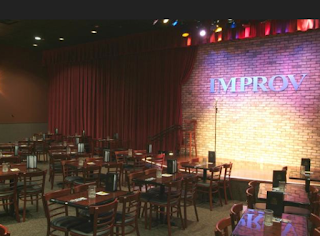 There is a 2 item minimum on the food and drink available at The Improv. I was a little concerned about the quality of the food at a club that is primarily known for it's funny headliners rather than the food they offer. However, everything we had was GREAT! The service was good. The drinks were good. The food was so good that we all cleaned our plates . . . even though we were laughing so hard it would have been easy to forget about our food and drinks all together. 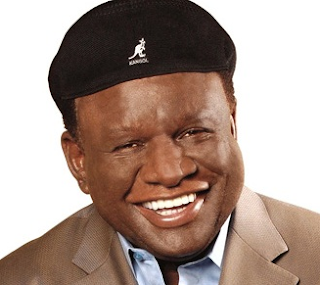 Two of George Wallace's signature lines are "I be thinkin' . . ." as he leads into a truly funny, unique way to look at some mundane part of life and ". . . 'cuz I do s#!+ like that" as he tells a story about some crazy experience that happened to him. As you can see there was definitely some language in the show, and you would need to factor that in to your decision of what show to go see and who you take with you. While this particular show was advertised as "family-friendly" you should definitely do your own research to figure out whether a specific comedian would be appropriate for your family. I personally have small children and none of the the comedians would have been fitting for them to hear. The comedy was not "blue" in the typical sense. (We've definitely heard some comedians in the past at other locations who were quite explicit and would only be appropriate for an over 21 audience.) I probably would have been comfortable taking older teenagers to see this group of comedians, but no younger than about 15, I think, depending on their maturity and your family approach to culture and experiences. I honestly have not had such a good time in a very long time. It would have been well worth the cost of the $30 tickets, but you do have to keep in mind the additional costs of food and drink as well as tipping the server. One way to enjoy this kind of event and not spend quite so much is to use a service like Goldstar. Through Goldstar you can access discounted tickets to multiple local events including The Improv. It's free to join and you simply look through the offers and see if something would work for you. Right now, for example, they have discounted tickets to both the Addison Improv location and the Arlington Improv locations (there are additional Improv locations around the country). Michael Blackston - from BET's ComicView - is going to be at the Arlington Improv over the next few weeks. You can get discounted tickets to his show for just $8.50 per ticket. Saturday Night Lives' Jay Pharaoh will be at the Addison Improv through July 13, 2013. The tickets for his show start at $11 - plus the mandatory 2 item purchase for each attendee. Note there is still a $4.75 service fee per ticket as well, but this is still a really good deal if you are wanting to try out The Improv. If you go check out one of these shows, let me know what you thought . . . I think we're going to go again soon, so I'd love to hear some recommendations.